MEMPHIS, Tenn. (AP) The Washington Wizards’ 15-point lead in the fourth quarter was enough to claim their fourth straight victory. 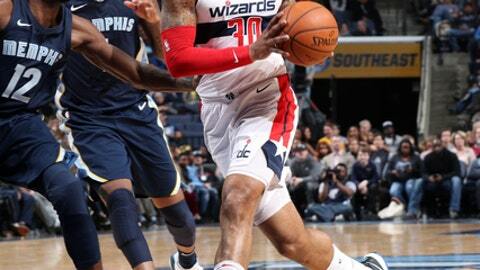 The Wizards weathered a late rally by Memphis to escape with a 102-100 win on Friday night. Bradley Beal led the Wizards with 34 points, while fellow guard John Wall added 25 points and nine assists. That change of pace for Washington came following an advantage that reached 17 in the third quarter and was still sitting at 15 with just under 9 minutes left. But Memphis used eight straight points to cut the deficit to seven points, then later crafted a 10-1 rally to pull within 98-97 on Tyreke Evans’ 3-pointer with 18 seconds left. Meanwhile, the Wizards made only 2 of 16 shots in the fourth. But Memphis couldn’t overtake the Wizards the rest of the way, and a pair of free throws by Markieff Morris with 3 seconds remaining provided enough cushion for Washington to escape. Morris finished with 12 points and matched his career high with 17 rebounds. Evans led Memphis with 26 points, while Marc Gasol finished with 17 points and 11 rebounds. Mario Chalmers had 13 points. Despite Wall and Beal combining to connect on 17 of 34 shots, Washingston still shot 39 percent for the game. ”To win on the road shooting 39 percent means we played the defense it takes to win,” Wizards coach Scott Brooks said. Wizards: F Mike Scott, who was shooting 66 percent (76 of 115) over the previous 14 games, made his first three shots and finished the night 4 of 6. … Morris recorded his second double-double of the season. The first came in the Wizards’ previous game Wednesday against the Knicks. … Morris had 17 rebounds against Dallas on Dec. 6, 2012, when he was a member of the Phoenix Suns. … Beal has recorded at least 30 points in seven games this season. Grizzlies: Memphis finished a 10-game stretch in which it didn’t play consecutive games in the same city. Seven of those were on the road. . Memphis is 1-12 against the Eastern Conference, with the only win coming Dec. 15 over Atlanta. … G Andrew Harrison sat out with a left shoulder injury. … Evans has 12 games scoring at least 25 points. … Memphis had 21 fast-break points, the seventh game this season in which it recorded at least 20. The Grizzlies had only seven games of at least 20 in all of the 2016-17 season. Wizards: Host Milwaukee on Saturday. Grizzlies: Face the New Orleans Pelicans at home on Wednesday.